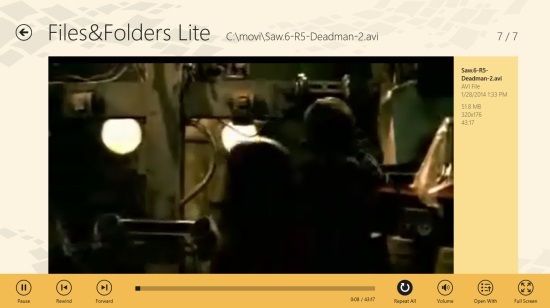 Files&Folders Lite is a Windows 8 File Manager App. You can use this app to browse through your system’s files and folders. The app can also play various audio and video files. Apart from that, it has support for RAR and ZIP files, and can easily open them. The main catchy feature of the app is that you have the option to pin any folder to the Start Screen for easy access. You can even access your desktop in snapped view, for which there is no option present in Windows 8 by default. The app is quite smooth in its function, and the files can be opened by a single click only. 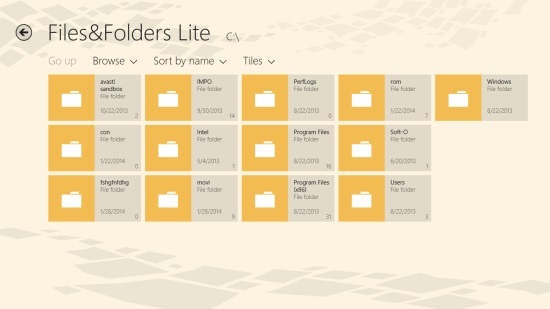 Files&Folders Lite is freely available in the Tools category of the Windows Store. You can use Files&Folders Lite in the same way as you use the Windows Explorer. As you get to the main screen of the app, you would be shown the main dashboard of the app where you can browse through all the files that are available on your system. In order to browse through the files that are available in your system, you can use the Browse drop down that is available on the interface. You can access a single drive at any time. ln order to get to any drive of your system, use the add drive option from there. Then, you can choose the drive to add it to the drop down. Then the drive would appear in the drop down for easy access. You can directly play the audio and video files, and can open images in this Windows 8 file manager app itself. You can also choose the Open With option, by right click on the file, to choose an application to play them. The audio files can even play in the background also, even when you are doing something else on your system. Nearly all the audio, video, image formats are supported in the app, but at some point if you are facing any difficulty in opening any file, then you can use the open with option to open them with any other application. This free Windows 8 file manager app can easily open the RAR and ZIP files. The good thing is, the app won’t even take much time to extract these files, and would open them with just a single click, without any delay. You can even pin the folders to the start screen, from where you can access them easily. This is one of the most catchy feature of this Windows 8 file manager app. The app also lets you access SkyDrive, and do everything you normally do with your account. There is also an option to access your DropBox account from here, but you have to pay some nominal amount to get that feature. Also check File Manager HD and Metro Commander. 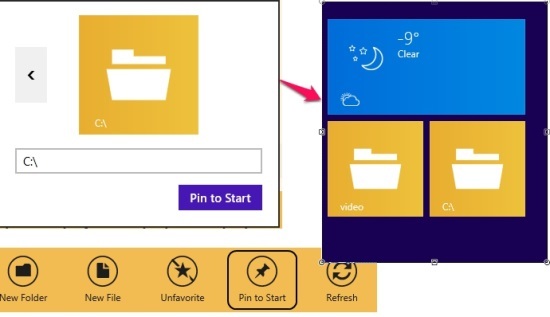 The app will allow you to pin folders o your start screen. There is an option to choose from 5 different backgrounds for the app, from the preferences in the Settings. You can choose a background image from your system also. You can also access your desktop in the snapped view of the app also. Support for opening multiple zip file formats, audios, videos, and media files. The app is a nice Windows 8 File Manager app, with good number of options. The best things about it are its catchy interface, option to pin the folders to the Start Screen, smooth working, and single click access of the file. You should try it for sure. Do share your experiences with us.